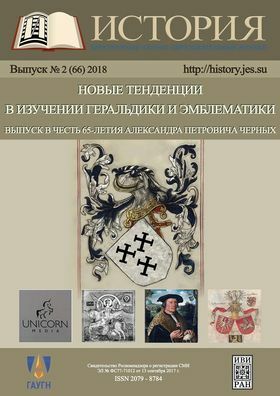 The following issue is dedicated to the 65th jubilee of Alexander P. Tchernik, a well-known specialist in the field of heraldry, author of more than 300 works on the topic. Being a lecturer of the State Academic University for the Humanities (SAUH) and scientific supervisor, he is the one who opened the wonderful world of heraldry to many authors of this edition. We sincerely wish Alexander Tchernik long years and success in further work! The articles included in the issue concern modern tendencies in the study of the emblematic space, both in its traditional heraldic sense and in the new forms of visual representation of the modern world. Thus the article by Aleksandr Mannin and Lubov Ciganova titled “Heraldic Sign System in Modern Logos. Communication Approach Experience” is aimed to “understand whether the modern language of the logos is similar to the sign system of coats of arms and banners”. The article by Denis Fomin-Nilov is an attempt to trace the development of University emblems in the modern world as a reflection of transformation of visual representation of public institutions on the example of State Academic University for the Humanities (SAUH) symbolics. A block of articles shows the results of the research of various sources of heraldry. The article by Kirill Elokhin is dedicated to portraits containing coats of arms as a phenomenon of European and world’s culture widespread since 15 century. A joint research of Kirill Elokhin and Daria Ryzhova concerns warriors’ shields of 12—19 centuries as a media space for the coats of arms. The article “Russian Coats of Arms in the 13th — 15th Centuries” by Vladislav Antonov is an investigation of earliest mentions of Russian arms in local and foreign sources. The article by Daria Ryzhova “Two Coats of Arms of Simon de Montfort” describes one of the earliest known cases of use of two different arms by one person. Two works were done on the verge of heraldry and Vexillology, these are articles The “Crimean Banners” of the Internal Guard of Russian Empire” by Igor Sandalov and “Roll of Arms on 1712: the Origin of the Emblems. The Banner of the Arkhangelsk Regiment” by Ilya Emelin. The jubilee Alexander Tchernik investigated the image of a peacock in the coat of arms of the town of Serpukhov, Moscow area. The devise of the peacock is frequently used in family and municipal heraldry of Europe, often being canting arms. The peacock did not show any negative connotation and thus was chosen by Francesco Santi for the image of the town. The article “Images of Animals and Plants in European Emblems and Heraldry: from Natural Representation to Symbolic Interpretation” by Evgeny Pchelov is dedicated to real and imaginary objects of nature, that on entering heraldic nomenclature have over lived the ideas that evoked them. Among others stands the article by Larisa Selivanova concerning the revival of the image of silphium plant known since 6 century BC during the Mussolini regime.